Recently Microsoft in association with Virgin Atlantic flight gave a wonderful surprise to the passenger on this festive of Christmas. 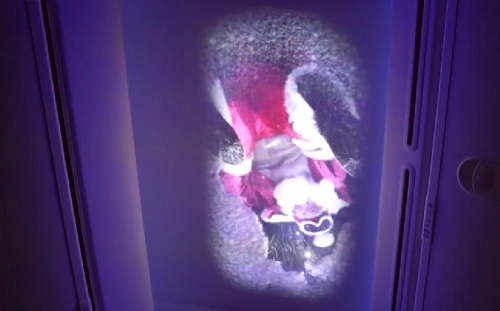 The Virgin Atlantic flight 11, flying from London Heathrow to Boston got the amazing surprise of Santa’s presence in the flight. When the passengers were entering in the Flight 11, each of them received a 8-inch quad-core 1.33GHz Linx Windows 8.1 tablet . The passengers entered the flight with great surprise ad expectation as they were told to find out more in course of their journey. After a short span, the captain of the plane the captain addressed the cabin crew to reveal the passengers that flight VS11 was just a hundred miles away from Santa Claus. This announcement set a brouhaha among the passengers. The eager passengers then started tracking the route of Santa with the Santa Tracker app which was there installed in the tablets they were provided. This app has been developed by the joint venture of Microsoft and NORAD. Finally they found that Santa was heading closer and closer to their flight. Next the passengers were dumb-founded when the found the ceiling of the plane showing snow wind and the sledge and finally the footprints of Santa. The crowd were rejoicing every moment of it irrespective of age. Finally, to everyone’s astonishment, Santa came inside the flight and spent some time out of his busy schedule with the passengers. So that was a memorable and awesome experience the passengers had in the Virgin Atlantic Flight. The cherry on the cake was the Linx tablets they got to carry off with them. I love to travel too much. Gifts very enjoyable.Surprises something beautiful .When all these are gather i feel full of joy. I hope I travel trip like these.